It was a fairy-tale ending to a tense chapter in the story of the Rosetta space mission this evening as ESA heard from its distant spacecraft for the first time in 31 months. Rosetta is chasing down Comet 67P/Churyumov-Gerasimenko, where it will become the first space mission to rendezvous with a comet, the first to attempt a landing on a comet’s surface, and the first to follow a comet as it swings around the Sun. Since its launch in 2004, Rosetta has made three flybys of Earth and one of Mars to help it on course to its rendezvous with 67P/Churyumov-Gerasimenko, encountering asteroids Steins and Lutetia along the way. Operating on solar energy alone, Rosetta was placed into a deep space slumber in June 2011 as it cruised out to a distance of nearly 800 million km from the warmth of the Sun, beyond the orbit of Jupiter. Now, as Rosetta’s orbit has brought it back to within ‘only’ 673 million km from the Sun, there is enough solar energy to power the spacecraft fully again. Thus today, still about 9 million km from the comet, Rosetta’s pre-programmed internal ‘alarm clock’ woke up the spacecraft. 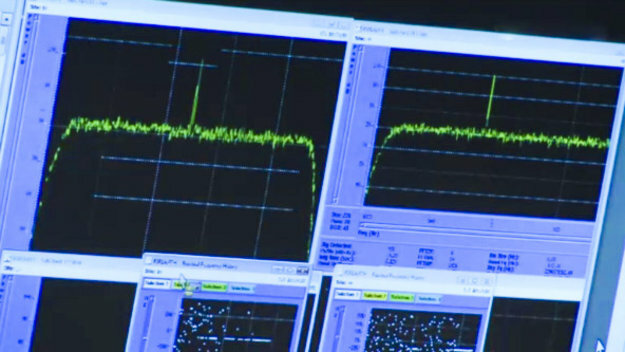 After warming up its key navigation instruments, coming out of a stabilising spin, and aiming its main radio antenna at Earth, Rosetta sent a signal to let mission operators know it had survived the most distant part of its journey.